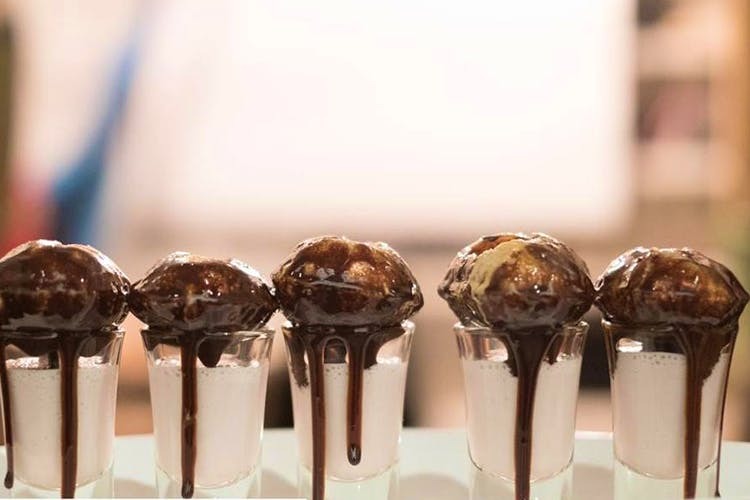 We found a new dessert paradise in Besant Nagar and this is no ordinary one. From “blind” milkshakes (read on to know what we mean!) to making your own sweet pani puris, BLIND CH3MISTRY is full of surprises one after the other. Starting at INR 200, here is what we are obsessing over this week! Let’s play the guessing game! The latest dessert studio to open doors in Besant Nagar, filled with hammocks, swings and few wooden seats in their small but quirky space offers more than just milkshakes. Called the Blind Series and priced at INR 220 this tops their menu and is quite the crowd puller. You can have it for free. But hold on, it comes with terms and conditions. Order yourself a Blind Series, like we did and what you have to do next is, guess what it is. The Blind Series is basically a secret milkshake of sorts – the identity is not revealed till the end of the week. Every Friday, BLIND CH3MISTRY changes their shake under this category and leaves it for us to guess. Best part? If you guess it right, you get to have it for free! If not, you have to wait till the weekend to figure it out, like we currently are. We guessed the shake to be all sorts of things – From Vanilla to M&M to Hazelnut to Kit Kat, but failed to guess it right. Keep an eye out on their social media handle (on Fridays) to know, if you guessed it incorrectly as well. The next quirky part of this menu is their range of Pani Puri options. This is not your ordinary chaat and is definitely for the ones who are in to experiment. Called the Dessert Chaat, all you got to do is choose your fillings from options like red velvet cake, jelly beans, choco-chips and more. Next choose your ice cream with options like classic vanilla, chocolate, and strawberry and finally select a milkshake from their Bachelor series – which is the very basic set of everyday shakes. And your Dessert Chaat is ready! Priced at INR 125, we think it’s worth the mouthful. This place also has everything from coffee shots, iced lattes to rice bowls and sandwiches, DIY french fries and even smoothie bowls, so there’s something for everyone. We’re pretty sure this place is going to be the next big thing in Bessy. So grab the gang and go already!